Hi my name is Nick. I have 20 years of teaching experience at every level of the game ranging from beginners to ATP/WTA professionals. My teaching career started at Murray State University as the assistant men's and women's coach. From there I worked as the head pro at clubs in Illinois and Hawaii before moving to Florida. I specialize in one on one instruction and believe that private lessons are the best way to maximize your tennis potential. Accomplishments: Played Number 1 singles and doubles at Murray State University (Divison 1). 3 time Ohio Valley Conference Player of the year. Ranked Number 38 in NCAA Divison 1. Achieved ATP singles and doubles ranking. Ranked Number 8 in Nation Men's 30's singles in 2009. Ranked Number 2 in Florida Men's open singles in 2008. 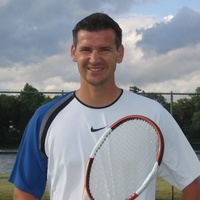 Ranked Number 1 in Florida Men's 30's singles in 2009. Finalist in singles and doubles at the National Men's 30's clay court championships. Wins over former ATP Top 100 players Bobby Reynolds and Bjorn Phau. Nick can recommend a location or come to any court inside the highlighted service area below. "Nick did a great job. I suggested 2 areas I wanted to work on, and beyond that he can focus on where he thinks I need work. The amazing thing is that he listened to me and we actually worked on the areas I requested, plus a lot more. But the important thing is that he listened - many coaches don't. I would definitely work with Nick again."